Citing danger of falling trees, floods and landslides, Ministry of Agriculture issues order temporarily closing Carmel area to visitors. Citing the danger of falling trees, floods and landslides, the Ministry of Agriculture issued a special “Forest Order” Thursday closing off the Carmel forests to unauthorized visitors. The order will remain in force for two and a half weeks, to enable vital reinforcement and pruning. The rare order was signed by Welfare Minister Yitzchak Herzog (Labor), who is in charge of Israel's forests. Herzog was recently placed in charge of Israel's forests instead of Agriculture Minister Shalom Simchon (Labor) when a journalistic expose revealed that Simchon had a conflict of interests, since he was a candidate for the Jewish National Fund chairmanship. The Forest Order is deemed necessary for maintenance of the forests; for the safety of the public; in order to prevent soil erosion and to enable ecological rehabilitation. It will expire December 26. The Ministry of Agriculture also warned of a high likelihood of floods over the weekend, when heavy rain is expected to fall. The soil of the Carmel region is currently in a precarious state because the plants that normally hold on to it have been burned and a layer of ash has sealed it off to water seepage. Following a special discussion convened by the Minister of Agriculture, the Drainage Administration is currently working to direct the expected water flow to predetermined channels, in order to minimize soil erosion. The head of the Carmel Drainage Administration, Moshe Yizre'eli, has instructed local authorities to clear all obstacles from the drainage canals within their catchment areas. 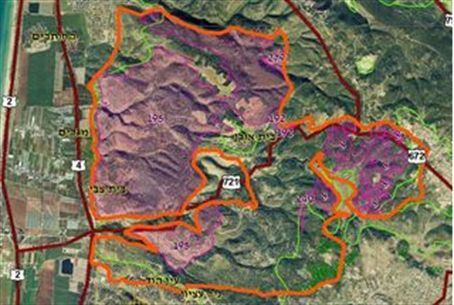 Minister of Environmental Protection Gilad Erdan toured the Carmel region Thursday and said that replanting of forests would not be carried out in the next two years, in order to allow the soil to recover first.